Stock photo of red barns in the middle of a large flat field in the prairie land of southern Saskatchewan, Canada. Red barns sit on the large prairie land in southern Saskatchewan, Canada. 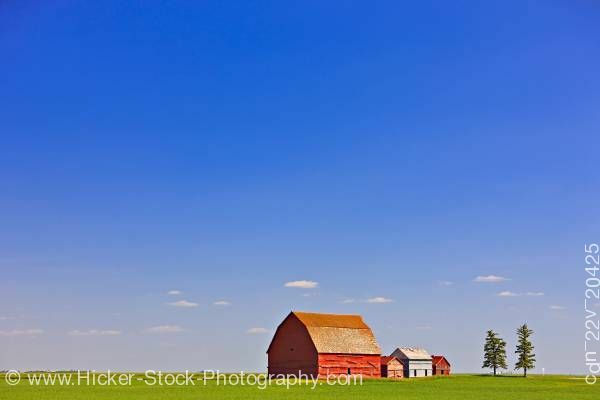 This stock photo shows red barns in the middle of a large flat field in the prairie land of southern Saskatchewan, Canada. An endless field of green prairie shows a large red barn and three other smaller buildings next to it. The red barn has a large four sided brown roof. A small window can be seen in the center of the barn wall. The three smaller structures sit close to the large barn. A blue building with two windows sits in between the two small red buildings. Two tall slender evergreen trees sit in the open field to the right of the buildings. A beautiful blue sky dominates the background. The sky shows wonderful blue hues of light blue reaching up to a deep blue. Sitting low in the sky are small puffy white clouds. Red barns in the middle of a large flat field in the prairie land of southern Saskatchewan, Canada.